Tom returned from MacHack (four days of marathon Mac-ness in Michigan), at 9:30 pm Saturday night, on a consistent five hours of sleep per night for the last five nights. Cathy met him at the airport and took him home to unpack and repack. While Tom was away, Cathy had been pretty busy with finishing up school and getting ready for the trip. Keeping the whole insane regimen going, we packed until 3:00 am. Sunday's activities restarted at 7:00 am, when Cathy got up an hour before the alarm went off. Shortly before 11:00, we were packed, loaded and on our way. The drive to Canada was uneventful. Entering Canada, the border guard asked us a series of rapid-fire questions about our plans. They were all easy questions, the obvious ones, plus some detailed ones like "where will your car be during the cruise?" He wanted to know if we knew the details well enough to not be making stuff up. We had another 45 minutes or so of driving to the parking area, arriving there around 2:30. The parking and transfer were quick and easy, but getting onto the ship was another matter. First we waited in line to go through a security check, like at an airport, but completely useless. As Tom walked through the metal detector, it went off. As that happened, Cathy asked for the ticket packet that he was carrying and he handed it to her, which the guard did not inspect. Then the security guy started working on figuring out why Tom beeped. (It turned out to be his watch.) Meanwhile, the x-ray operator wanted to have the camera case inspected. Cathy had locked it with a zip tie, which had to be cut. So we dug out our cutting instruments(!) and cut the tie while the security guard checked on some other passengers. After we had full unobserved access to the case for several minutes, he came back. The case in question is a hard-plastic box the size of a medium-large suitcase, filled with layers of foam sheets, with holes cut to fit our camera equipment. Cathy opened the case for the guy, showing the top layer of foam with cables in compartments. She peeled that layer back to reveal a corner of the next layer, and pulled out a telephoto lens to show him. She explained that the rest of the case was also camera equipment. He looked totally overwhelmed and after listening to Cathy's assertion that it was all camera equipment a couple of times, he approved our luggage. Needless to say, the rest of the case could have contained anything. We got into the next line, where we were given forms to fill out and a boarding order number (28). Then we got into another line where we were handed an advertisement for the spa on the ship. Then we were herded into a huge room with about 20 rows of 40 seats. From this room, people were being fed into another, very long, line. In theory, we were being called into the next line by boarding order number, but then it looked like maybe it was by row. While we waited, attendants would come around and verify that we had filled out our forms. After we'd been checked a couple of times, one of the attendants bellowed out instructions: "please put your forms out where we can see them, then after your forms have been checked, put them away." This brilliant strategy means that people who are clueless and have their forms tucked away look exactly like people who have been inspected and approved. The attendants eventually made it clear that they were not at all organized, were inspecting rows at random, and putting people into the next line also in random order. Cathy eventually tired of the chaos and pointed out to one of the attendants that people were lining up in random order and that we had waited long enough. So, the next time people loaded up, about half of our row got into line while the rest continued to wait. The next line took us to the cruise line check-in, where we showed our tickets and were issued card keys. The next line took us through US Immigration (since we would next set foot on US soil). The next line finally took us onto the ship, at around 4:00 pm. That was seven lines, including waiting in the randomizer room. 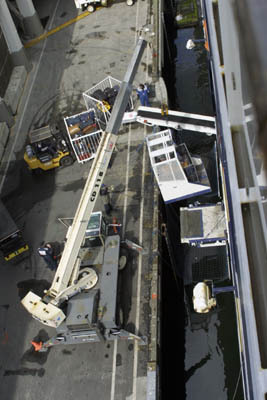 As we loaded onto the ship, we saw them loading the luggage and learned why they don't guarantee that your luggage will arrive. When they load luggage onto an airplane, if your bag falls off the cart, no big deal. But when they load luggage onto a ship, if a bag jumps off the cart, it sinks. The ship left port on schedule, around 5:00 pm. When we got aboard, we checked out the room, then took a nap. We were hungry and dinner wasn't until 8:30, so we called up room service and were puzzled to find out that there's no charge for room service. How weird is that? Shouldn't there be some cost to making someone run up to our room to bring us food? With no prices, how do you tip? And we were told that we should wait until the end of the cruise and tip once. Curious. After our ad-hoc meal, the last of our luggage finally showed up. 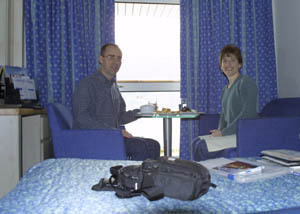 Our stateroom is nice, much nicer than the last cruise we went on. We have a private balcony, a king bed, a desk, a love seat and a 14 inch circular table and barely enough room to walk from the door, past the bed and desk to the balcony. With no visible storage, Tom looked around for a closet, opened a narrow door and exclaimed, "this closet is our bathroom!" There were three more doors that revealed maybe enough storage for most of our stuff, but it quickly became obvious that our three suitcases, the monster camera case, the tripod duffle and a computer bag were not going to fit in the closet, not even close. Fearing that we would have to spend the entire cruise crawling over suitcases, we got creative. Fortunately, a bunch of them fit under the bed and the rest went into the bottom of the two narrow closets. We crammed clothes, camera equipment, computer equipment and sundries into every drawer, shelf, nook and cranny. 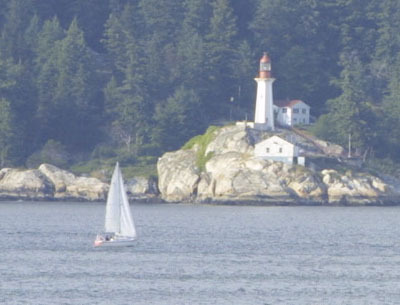 As we left Vancouver and started up the coast, we got some nice views from our room. Later in the evening, we were invited to a cocktail reception for the photography class where we met the instructor (Arthur) and some of our classmates. We have the late seating for dinner, and are seated with Arthur, a couple from Texas we spent time chatting with at the reception (Erik and Christine), a woman who was on the previous cruise/class and her mother (Jules and Estelle), and Charles our eldest companion at 82. Our table is in an amazing location, near a large window on the side and one table away from a sweeping view out of the rear of the ship. Dinner was nice, five courses, reasonable variety. The salad course was interesting. After the salads were delivered, the waiter came around with a selection of three salad dressings. Of the three, he was clearly pushing his favorite, which the first couple of people chose. When he got to Tom, he picked a different one and the waiter said, "excellent choice, sir." So we figured despite his sales pitch, the waiter would love whatever choice we made. As he got near the end of the journey around the table, someone finally picked the third choice and the waiter grimaced and said, "well, if that's really what you want." Arthur talked to us for two two-hour sessions. We learned digital photography stuff. Arthur had various technical issues during the classes. Cathy quickly jumped in and showed him how to use the projector and learned how to control the lights and sound system from the control booth. Soon she was Arthur's personal engineer. The ship spent the day steaming through the inside passage, so we had nice scenery to look at as we motored up the coast. 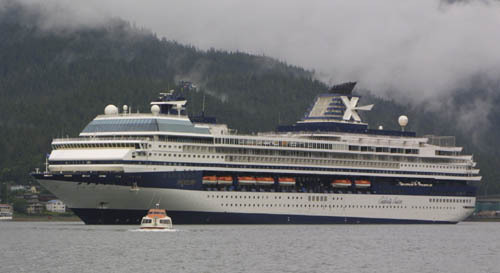 The ship docked at Ketchikan, Alaska. 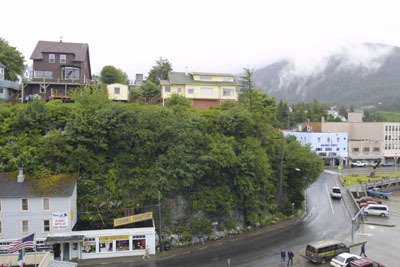 The town is built on a steep, narrow strip of land on the coast of a small island. We spent the morning wandering around town taking photos. That afternoon, we went to the lumberjack sports show, a shameless tourist extravaganza. The audience was divided into two sections, each side rooting for their team of competitors. 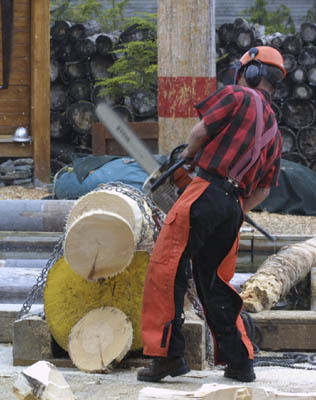 The competition was comprised of a series of events: chopping logs with axes and chainsaws, climbing poles, walking on floating logs, etc. Mix in some corny humor and you've got a lumberjack show. We enjoyed it immensely. After the show, we had lunch, did some shopping and spent a bit of time in one of the many Internet cafes. After dinner, we had a critiquing session where everyone gave their best shots of the day to Arthur and he'd put them up on a projector and tell everyone compelling reasons to dislike each and every photo. We paid good money for this service. In the morning, we had another couple of hours of lecture. We can send you our class notes if you like. 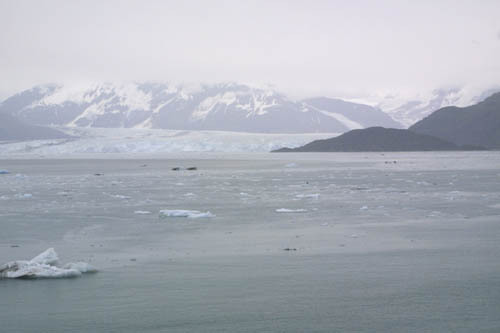 In the afternoon, the ship steamed past Hubbard Glacier. The water was littered with chunks of ice from very small to the size of a car. It was cold and gray, very forlorn. Many of the ice chunks were bobbing up and down making splashing sounds. It must have been like that for the Titanic survivors, with only the sound of ice blobs breaking up the cold dark silence. 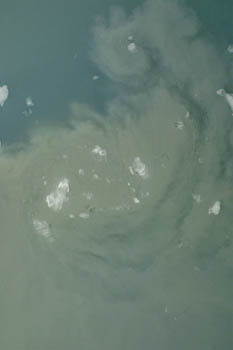 We could also see the ship churning up dark brown muck, presumably glacial till that is being constantly dumped into the bay. At dinner, our charming Polish cocktail waitress got talked into telling us American jokes. Perhaps inspired by that lively interaction, our head waiter Julius started showing us puzzles (move one toothpick to turn these five squares into four squares of the same size, that sort of thing). The ship docked in Juneau, where we had two excursions planned, so we got off to an 8:30 am start to a long day. The ship was anchored in the bay, so we had to take a tender to the dock. Cathy explained to Tom the procedure for using the ship's tenders to get to shore, and Tom wondered, "do people afraid of small boats get to ride on chicken tenders?" 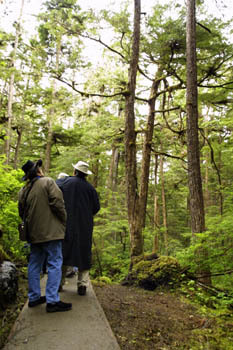 Our first excursion was a walk through a rainforest in Tongass National Forest. We were met by two guides and a bus. Scott drove while Kaci entertained us. She had unlimited energy and a charming accent. When prompted, she explained that she was from Jamaica and had decided to study at the University of Alaska because she wanted to experience something very different from her Jamaican upbringing. She was incredibly knowledgeable about Alaskan flora, we were amazed to learn she was not only so far from home, but relatively new as a guide. From noon to 3:30, we went back to the ship for lunch and a quick power nap. 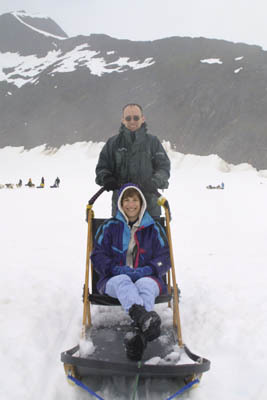 Our next adventure was a helicopter ride up to a dogsled training camp on a glacier. 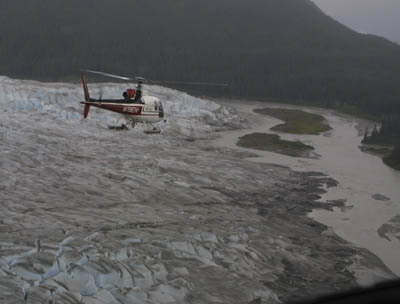 The helicopter ride was stunning, giving us an amazing tour of the Juneau area and the glacier from where it melts into the ocean up to the camp. Despite the clouds and rain, the flight was very smooth. Lambert, our French pilot, was apparently the head pilot and gave us a very nice commentary with the flight. There were around 150 dogs and a dozen or so people living at the camp. They spend the summers on a glacier so that the dogs aren't out of condition when training starts up in the fall. We were joined by another tourist and guided by Tasha. The setup was nine dogs harnessed to two sleds. Each sled had a driver and a passenger. Tasha drove the lead sled, and told the dogs what to do. The three of us rotated through driving the rear sled, where our job was to not fall off and to apply the brake so that our sled didn't slam into Tasha when we stopped. The dogs are most comfortable when the temperature is between zero and 25 below, so we had to make frequent stops to let the dogs cool off. We tourists were plenty cool, with a steady rain just above freezing. The weather seemed to be getting worse, so they cancelled the final group of the day. When we were done with the sleds, they were pretty anxious to get us loaded up and back to Juneau before the weather got too bad to fly. There were lots of jokes about us needing to spend the night at the camp and eat high-protein dog food for dinner. On the flight back, Lambert decided that the weather wasn't so bad after all and maybe he'd overreacted in canceling the last group, but perhaps that's how you get to be a trusted and experienced pilot. The glacier adventure ran late, so we were a bit anxious about catching the last tender to the ship. We made the tender with time to spare, but we did arrive back at the ship just 20 minutes before dinner in soaking wet coats and many layers down to our thermal long johns. We made it into our dinner attire in record time. Julius had more puzzles for us. Friday morning, we stopped in Sitka. 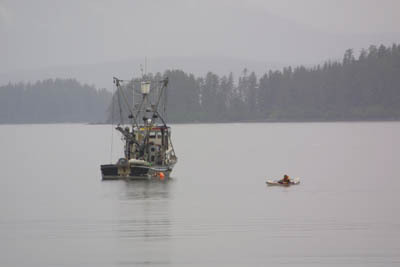 Again, we were anchored in the bay and had to take tenders to the dock. We rolled our own tour, starting with Totem Park. 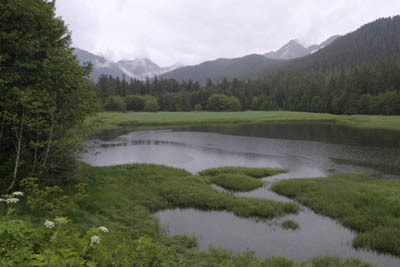 The park is a chunk of forest much like the rainforest walk in Juneau. It's named for the collection of totem poles displayed along the trails. The totems were interesting, but not very photogenic in the light we had. 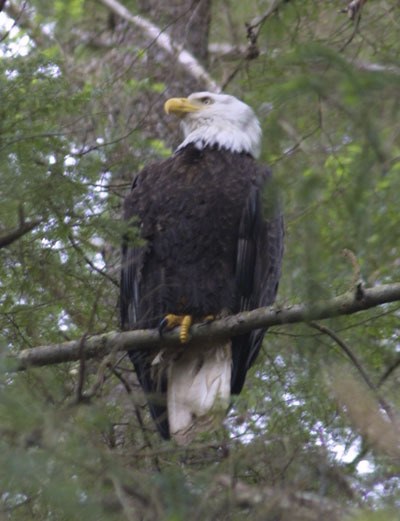 We did however see a bald eagle sitting on a branch about 60 feet above us. 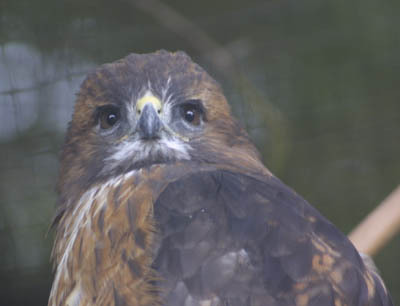 Next we went to the Raptor Center, which is a rehab facility for injured birds, mostly eagles and owls. The birds were in a variety of enclosures, indoors, outdoors in a net cage or even open. We took a cab to Starrigavan Bay, which turned out to be quite an adventure. We called a cab, and a cab picked us up, but it turned out that our cabbie had swooped in and taken the fare from the cab that was dispatched to pick us up. So we got to listen to the on-air battle of the cabbies. The bay was about 20 minutes out of town and miles from anything else, so we asked the cabbie to pick us up in an hour. 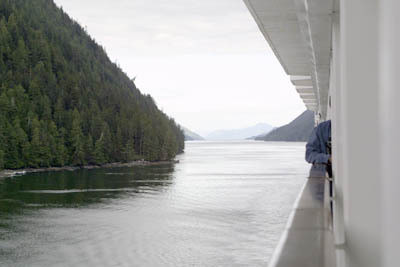 We had to hope he didn't get fired in the meantime, leaving us miles from town when our ship departed. The cab did return, although we don't know if the other cabbie figured out that she got robbed of two fares (with nice tips, given that we were grateful that he did return as promised). Dinner was the last formal affair of the cruise. Cathy didn't go to the late-night critique, but Tom did and was immediately elected substitute engineer in Cathy's absence; guilt by association it would seem. We had the last two critiquing sessions in the morning and afternoon. Tom printed out a few pictures on the printers Arthur supplied. 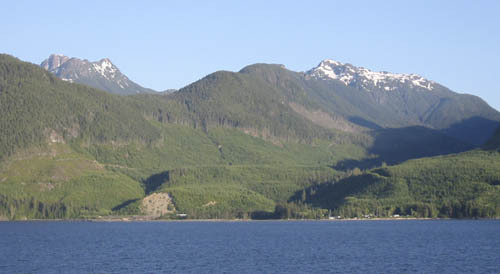 We returned through the inside passage and got some good weather and nice views. Before dinner we started packing; we had to have our suitcases outside our room by 11:00. We had a fun last dinner with the group. The waiters livened up the evening with more goofiness.